OPPO has announced its latest model F9 which is expected to be launched in Sri Lanka by first week of September. OPPO F9 is the brand-new breakthrough F series smartphone that will be shipped with VOOC flash charge, gradient colours, as well as a unique Waterdrop Screen design. OPPO has led the industry through so many firsts, like first worldwide beautified phone, first rotating camera, first phone with AI beautification, first 25MP selfie camera and many more, setting the benchmark high enough for its competitors while providing the best to its consumers. OPPO has a designated a quality check lab to regularly spot check the handsets from the beginning to mass production to manage and control the handset quality. The Lab tests are divided into electrical performance tests, structural analyses (destructive, structure-plug), environmental aging test (continuous aging of functional components, adaptability in various environments). The total number of tests is more than 150. OPPO’s VOOC Technology is a ground-breaking innovation with 4x faster charging speed than conventional chargers, the VOOC flash charging system will make your phone ready to go when you are on your way out the door. The 5-layer protection when compared with the conventional high current protection gives you protection from the adaptor to the port and interior of the phone. VOOC has replaced the voltage reducing circuit with an MCU, effectively preventing a mobile phone from overheating while charging. OPPO F9 also uses a gorgeous gradient colour design, again a first in the F series. 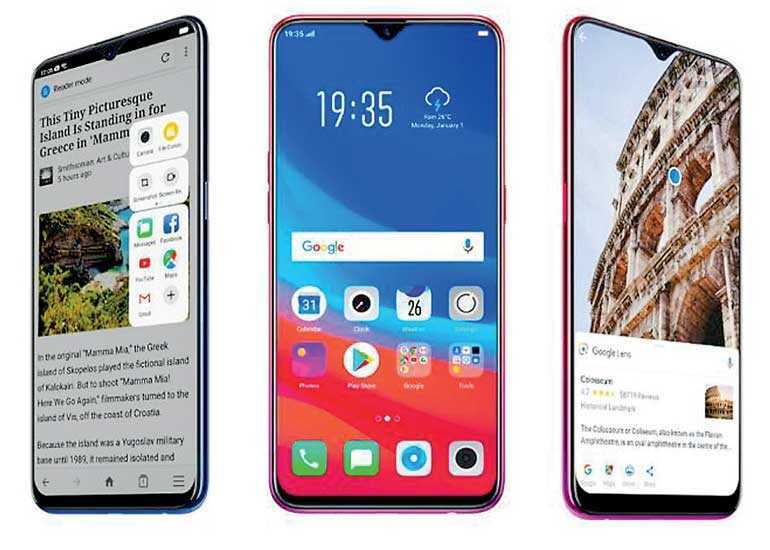 OPPO created this design because of technological advances in colour processes, as gradient colours in the market are already popular among young people. Previously, smartphone design using flat colour profiles could be considered dull or static while with gradient colour, now young users can show of their personality and attitude. The three colours on offer are Sunrise Red, Twilight Blue and Starry Purple, with inspiration coming from nature – sunrise, twilight, and starry skies. OPPO wants to infuse these feelings into the design of the product to provide consumers with vitality rooted in nature. Moreover, to achieve a unified design, OPPO F9 for the first time applies a gradient design on the side frame, making the sides and the back a naturally connected whole. In addition to the unique gradient colour options, the device will also feature OPPO’s first FHD+ Waterdrop Screen with a high screen-to-body ratio up to 90.8%. This provides a vivid, visual enjoyment without increasing the size of the phone while the high-resolution screen offers a more immersive experience to consumers. OPPO F9 with its VOOC fast charging and Waterdrop Screen is an innovative device. With its commitment to the ‘Art of Technology’ and the ‘Pursuit of Perfection’, OPPO F9 continues OPPO’s tradition of always putting the user first.